← and the winner is …. What is a Second Cousin Once Removed? When meeting a new family member, one who is living or one who died long ago, I always want to put a label on them. I feel a need to know exactly what our relationship is, but it’s one of the things I’ve never got to grips with. I find it easier to go to my ancestry site, where you can just click on the other persons name and find ‘their relationship to you’, but it would be nice to be able to work it out for myself. Through ancestry I know the cousins I recently found in America are my third cousins once removed, and my new family in Australia are my third cousins, but I had no idea how this was figured out. I’ve always wondered what my cousin Sue’s children are ‘to me’, and now I know they are my first cousins once removed! I think! 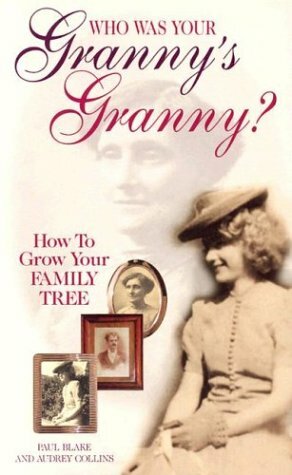 Who Was Your Granny’s Granny, Blake & Collins, foulsham publishers England, 2003. This entry was posted in jackiedinnis and tagged Family History, once removed, relationships, second cousin. Bookmark the permalink. 11 Responses to What is a Second Cousin Once Removed? I heard it explained on the radio many years ago as follows. To be cousins, second cousins etc you must be of the same generation. The next generation down is once removed and so on. So yes you are a first cousin once removed to my children and I am the same relation to your children. However, our children are the next generation down so their relationship is second cousins. I find this quite easy to remember and work out (usually)! To answer Petra’s question I’m not sure what or if we are officially related. Our uncle and her auntie were married but we don’t actually share any ancestors. Over to you, Jackie, for the answer to that one! I might need some time for this puzzle! And I thought I’d done so well in finding out about our relationships to one another’s children! If we don’t actually share any family, maybe we’re not ‘officially related’ but having met Petra I feel she is ‘one of the family’. It was a question I was asked a few times as a registrar and fortunately thanks to my genealogical interest was able to explain. Both you and Sue have done good explanations. I always think of the first number as a way of explaining how far removed from the original siblings and then the removeds explain the generation gaps between the cousins. However I always best to draw it! Of course the other confusion is that many cultures use the word ‘cousin’ to signify any family relationship! Hi Becky, how lovely to hear from a professional, thank you for your comment. It gives me confidence that the more I keep looking at generation gaps and cousins, the better able I will become to know who they are! Drawing it is a great idea, then you have something on paper you can look at. Thank you so much for commenting. Thank you both Jackie and Sue. I remember so well the excitement and pleasure at finding out I had Dinnis family and the huge delight in feeling that the connection meant I belonged. Even if the link is through marriage Auntie Margaret and Uncle Ron were our core and we will always be family.